Note: The Credit Application and Get Pre-Approved Form must be defined before they will function on your website. The Credit Application Settings and Get Pre-Approved Settings allow you to set notifications as well as customize the credit application form and the Get Pre-Approved form. *Note -The options you are presented with for the Get Pre-Approved form and the Credit Applications are the same. To define the information requested in your Get Pre-Approved form, hover the mouse over Settings, then Messages, then click Get Pre-Approved. To define the information requested in your Credit Application form, hover the mouse over Settings, then Messages, then click Credit Application. 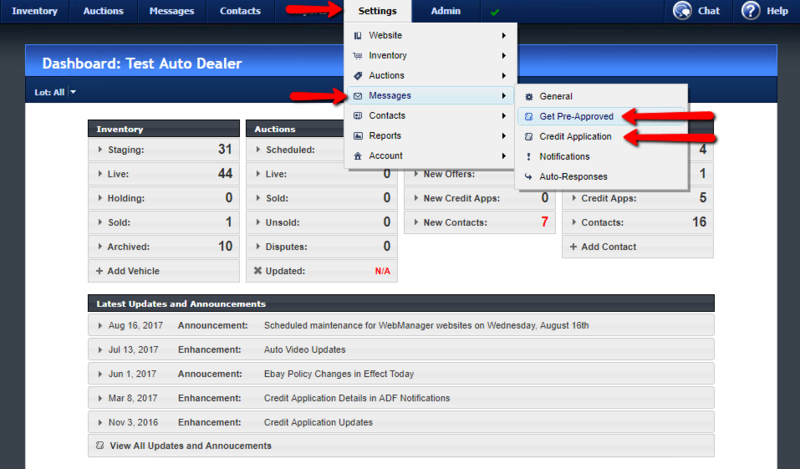 You can choose to include credit applications as attachments to notification messages that are sent to you when a user submits a credit application. You can select whether the attachment should be in plain Text (more readable and suitable for printing), or XML (more useful for use with programs that can import this file format). You customize your Credit Application by choosing which form sections you want to enable in your application, such as Personal Information, Employment Information, Residential Information, Financial Information, etc. You can also customize the text for the section headings. 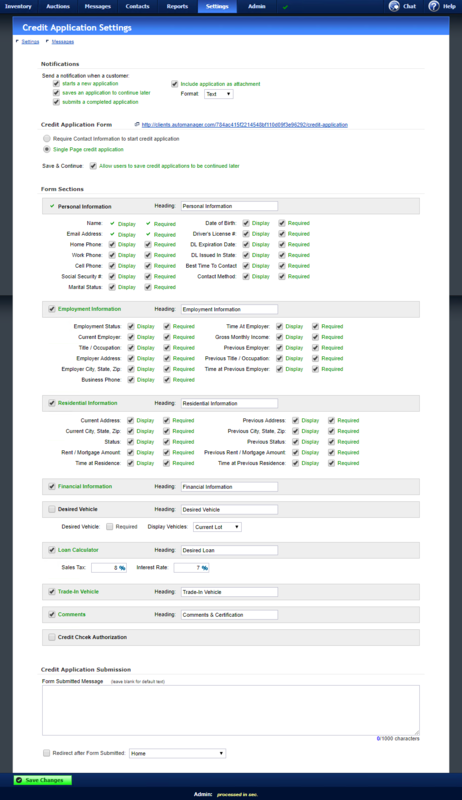 For some of the form sections, you can also choose which fields should be displayed, and optionally required. Fields that aren’t displayed are left off the credit application. Fields that are required must have a value before the credit application can be submitted. When users submit your credit application, your website will display a standard confirmation message. You can replace this text with your own message to be displayed instead. This option gives you the ability to display a more elaborate message using the full capabilities of our web page design editor, or directing the user to other content that already exists on your website.